"This book as a message for both the children and the adults who read it and I even want to make my own Sparkle Egg... as a reminder that God has and will forgive me as I repent of my sins." "What a beautiful book - with a simple and powerful message! The Sparkle Egg illustrates the gift of God's grace in a way that children of all ages can easily understand and remember. 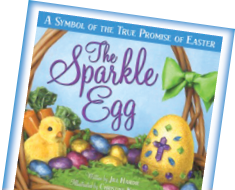 I am looking forward to using The Sparkle Egg story and making the sparkle eggs in our Sunday school class to teach our children about the complete forgiveness of God through His Son Jesus." "I loved The Sparkle Box, so I was very excited to read The Sparkle Egg and I was not disappointed. I love the beautiful way that Jill Hardie weaves the story of Sam' guilt, then acceptance of God's grace, which is a gift. She did this in such a simple way that children of all ages can understand. I look forward to more books from this wonderful author." "I highly recommend this book for EVERYONE. It is such an amazing story, well written, and the illustrations are amazing. This book is truly for any age and really gives perspective on the TRUE meaning of Easter and puts it in a way that anyone can understand." Artwork featured above is from The Sparkle Egg, published by Ideals Children's Books. Art copyright © 2014 by Christine Kornacki. TheSparkleEgg.com and its contents are copyright protected by Jill Hardie.